Don’t wait for a plumbing emergency! Learn to turn off your home’s water supply now with this guide to a potentially money-saving dry run. Chances are there’ll come a time when you’ll have to turn off the water supply in your home. You may need to do so for a scheduled plumbing repair or before leaving on a long trip. 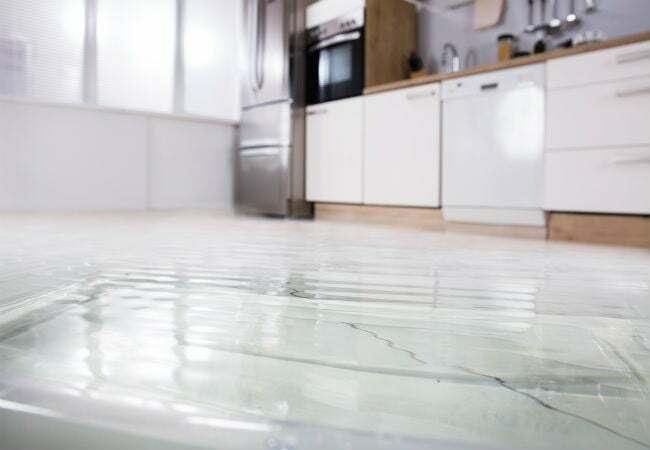 Then there are the emergency situations—such as when a pipe bursts somewhere behind the drywall or your bathroom is flooded with water—at which point there’s often very little time to react. What’s more, closing and re-opening the valves periodically will prevent them from getting stuck in place and allow you to inspect them for corrosion or broken connections. So it makes sense to familiarize yourself now with how to turn off the water supply (and educate family members as well) to make regular maintenance easier and even save hundreds or even thousands of dollars of repair costs in a worst-case scenario. As there’s no one exact place in every house where water supply valves are located, either, it could take some time to find them—time you won’t have if water is rapidly soaking through the second-floor ceiling. So we’ve shared tips on how to turn off water to the entire house or just to specific fixtures and appliances, as needed. Learn the basics of both and you’ll be prepared for whatever plumbing predicament may arise. Here’s how to switch off the water main shutoff valve. The water main shutoff valve could be in a number of places, depending on the age of your home and the climate of your location. The knob will either be a gate valve, which looks like a circular spigot, or a ball valve, which has a lever-style handle. • Inside the house. Water supply pipes from the city typically run from the street side of your house to the indoors. So check out utility areas—such as the garage, laundry room, or basement—along exterior walls facing the street. A likely place to start looking is near your water heater. In a basement, the pipe will likely be at eye level; on main floors, it will often be located lower down. • Outdoors on an exterior wall. In some warmer climates, the shutoff valve may be located outside the home on an exterior wall. Start looking for it near your outdoor faucet. • Outdoors buried near the street. If you can’t find the valve in or around the house, it’s time to hit the street. There’s usually a water supply shutoff valve next to your water meter outside where the city can easily turn on or off your water. It will likely be below an access panel buried in the ground, near the street. The access panel may require a special tool called a meter key (sold at most hardware stores) to remove the cover. There may be two valves, one for the homeowner (on the side of the water meter closest to the house) and one for the city (on the side of the water meter closest to the street). Or there may just be one valve, for the city’s use. It may not be permitted for homeowners to use this valve, so contact your water utility company to check. To turn the water supply off, give a gate valve a few turns clockwise until you can’t turn it any longer. For ball valves, turn the lever clockwise 90 degrees. Relieve the pressure in the pipes by draining the water that’s already in them. Turn on a sink located in the lowest level of your home, so water in the pipes from the floors above drain all the way down. Make sure to open both the hot and cold taps and run them until they empty fully. Once repairs are complete, turn the water back on by twisting the valve counter-clockwise. To ensure that it’s back in good working order, turn on a faucet and allow a few minutes for the water to reach it. Bonus tip: Label the valve for the next time it is needed, putting arrows that indicate which way to turn in order to shut off and turn on the water. If there’s just one fixture in your home that is malfunctioning, you may be able to turn off the water to that particular spot. That way, you can continue to use the plumbing in the rest of the house while addressing the problem. Appliances and fixtures like dishwashers, refrigerators, washing machines, toilets, and sinks usually have their own individual shutoff valves that are helpful in times of repairs. Look for a small round or oval knob near the appliance or fixture, usually attached to flexible tubing, which you can turn clockwise to stop the water flow.